Progressive Adventism has a long-standing habit of using propaganda in an attempt to get their way on significant church decisions. For instance, in 1995 the Review Magazine announced that the church designated 1995 as “Year of the Adventist Woman.” In an attempt to soften the world church towards women’s ordination, The Review Magazine was laden with pro-WO articles throughout the first half of that year (1995). It was so blatant that a pro-WO pastor told me “This is pure propaganda.” He was correct. In 2015, many of our University and Hospital churches had sermons on women of the Bible in order to push the extra-biblical narrative that women should be ordained to the pastoral ministry. One of those churches was Loma Linda on February 7, 2015. Another one was the PUC College Church on May 9, 2015. On 5-9-2015, Julie Lee spoke at the PUC College Church. The Pastor (Mark Witas) asked her to preach about Mary of Magdala, during PUC’s month-long series on women in the Bible prior to GC Session 2015. Starts at 1:03:20. She reads about Mary anointing the feet of Jesus. 1:12 — Tells the story of Mary washing Jesus’ feet at the feast. Mary had to be vulnerable to receive forgiveness. Encountering the risen Lord at the tomb, she became an Apostle to the Apostles. Calling Mary an apostle to the apostles is the result of imposing a feminist bias on Scripture. This is common among pro WO individuals who seek to create a feminist narrative, where none exists. “So what does vulnerability mean for us as a Church? As a congregation do you feel that we’ve allowed ourselves to be vulnerable at times? Do we allow for feelings and emotional exposure? In our faith and spiritual journey do we embrace uncertainty and give ourselves permission to exist in a space of mystery with no certain answers? Uncertainty and mystery are recurring buzzwords in integral spirituality. “Or have we as the Church numbed vulnerability? The other thing that we do is we make everything uncertain, certain. Religion has gone from a belief in faith and mystery to certainty. I’m right you’re wrong. There’s no discourse anymore. She then quotes from Pema Chödrön. 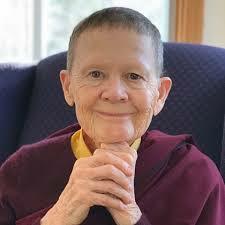 Pema Chodron is an American Tibetan Buddhist. She is an ordained nun, acharya and disciple of Chögyam Trungpa Rinpoche. Chögyam Trungpa was a Buddhist meditation master. Notice how effortlessly progressive Adventism quotes individuals like this, blending their words with a Bible story. “Somewhere we are taught to tame our emotions, to tame the Bible. And when it comes to our faith journey, we should strip ourselves of all vulnerability. Don’t ever be afraid, Jesus is with you. Don’t ever be sad. Have faith in God. Don’t ever be weak. The Lord is our strength. All of those things true, but sometimes the message is be PERFECT. And I’m not. So here’s me. Sometimes I doubt whether or not I still wanna be Adventist. Sometimes I love being Adventist. I love bacon—there I said it. I watch an embarrassing amount of TV—I am determined to finish the Family Tie series. I watch it so much that my youngest son knows the theme song. Vulnerability is the birthplace of innovation and creativity and change. Vulnerability ignites discussion. Think of our church community— those courageous people who dared to speak up first. The first openly gay church member. Coupling our imagination to the Bible through meditation—as taught by a Jesuit priest— teaches us to be vulnerable and emotive. Celebrating sin (homosexuality, divorce, and alcoholism) is courageous. Ordaining women is so desirable, that reinterpreting Bible stories to make a woman an apostle to the Apostles is justified. If Jesus had showed himself to a disciple (a man), they might have messed up the story (never mind that the New Testament Bible was written by these faithful men, and the glorious gospel of salvation was effectively shared by them throughout the Apostolic era). Quoting Buddhists and Tibetan meditation masters is a viable source of truth to share with 800 college students. We can expect to see more of this in 2019 and 2020.